K-Seal Expert Advice What is the Difference Between Coolant and Antifreeze? As far as a car’s radiator is concerned, winter – and the freezing temperatures that it brings around the world – is the most dangerous time of the year. The cold can have a seizing-up effect and severely affect the car’s engine; rendering it unable to run and necessitating expensive repairs. You could even need to scrapping of the car completely! To get round this, car owners employ antifreeze, which is often confused with coolant. Although you might think that coolant and antifreeze are one and the same, you’re both right and wrong. Antifreeze is commonly used as one of the components of a coolant mixture – coolant is generally a 50-50 split between antifreeze and water. Antifreeze (specifically the ethylene glycol, which is its main ingredient) is used to lower the freezing point of the liquid that circulates around the engine of a vehicle. This helps prevent the liquid freezing during cold temperatures, as well as raising the boiling point of the liquid so that it doesn’t evaporate. The coolant also keeps the internal parts of the engine lubricated so that they work smoothly. The two common colors of antifreeze can also be the cause of confusion. Why should one be green and one orange? The orange antifreeze is usually “extended life” antifreeze that lasts for longer than the green type due to a different type of corrosion inhibitor. 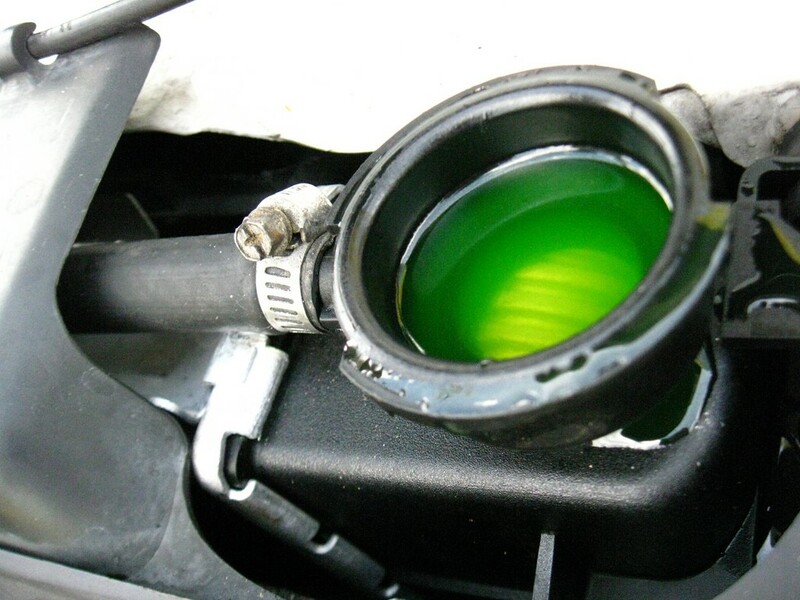 Although there are two colors of antifreeze, neither type of antifreeze is the same as coolant. Instead, they should both be mixed with water (not with each other) to produce coolant, and never poured into an engine system by themselves. The addition of water distinguishes antifreeze from engine coolant or radiator coolant – turning antifreeze into coolant and ensuring that it can effectively perform its main task: preventing both freezing and overheating within a vehicle’s engine. Does antifreeze go in the engine coolant? Once mixed with water, you simply pour antifreeze into the same place as the engine coolant: the expansion tank, or reservoir. It will then filter ’round the engine and mix with your coolant to make sure the liquid does not freeze. If you have already applied K-Seal to your vehicle, all three of the engine coolant, antifreeze and K-Seal will mix without a problem – protecting your car from leaks and potential damage to your engine. What should I do if I constantly need to top up my coolant with antifreeze? If your car is losing coolant it can often indicate a problem with the car radiator or head gasket. K-Seal is a scientifically proven, coolant leak repair system for this problem. Use our simple stockist search facility and you can get back on the road fast. Need Advice About Your Car Radiator Leak? Find out how to maintain and repair your car radiator with our expert guides.